An excellent all-round console with a fantastic catalog of AAA games, the slimmed down PS4 is better in almost every way compared to the original – barring one notable exception. Sony's PlayStation 4 console has now been slimmed down into a 'PS4 Slim' variant. But although it's had a design upgrade, it's still a fantastic console – and we say that knowing full well what the premium capabilities of the 4K-enabled PS4 Pro and the approaching launch of the the PS5 have to offer. As well as a size reduction, the PS4 Slim model knocks the price down from the original PS4 too. That means you're getting a better-looking console for less. Of course there are compromises – there's no 4K resolution and no optical audio output – but if you can work within those limitations, the PlayStation 4 Slim offers a lot of bang for your buck. The compact size of the console makes the PS4 Slim a better fit in most rooms, and as an added bonus it runs quieter and uses up less power than the first PlayStation 4. If you need another reason to buy it, you can get it in Glacier White in Europe and Asia. With all these positives and one or two negatives in mind, should original PS4 owners upgrade? Or should PlayStation 4 newbies pick this over the PS4 Pro? We'll try and answer some of those questions here. Let's not forget Microsoft either: the Xbox One S has upped the stakes by adding a 4K Blu-ray player, 4K upscaling, and HDR to the Xbox One. At the premium end of the market there's the Xbox One X too, plus a new Xbox on the way. For price comparison purposes, you can pick up the PS4 Slim for £299.95 / $299.99 / AU$449 or thereabouts for the 1TB box (the 500GB edition is still hanging around in various places for slightly less). Bear in mind gaming bundles are always being offered too – if you need something to sweeten the deal, try and get a game or two included. Even though the PS4 Slim is the budget offering next to the PS4 Pro, it doesn't necessarily take any shortcuts in terms of specs – you'll find this console matches the original PlayStation 4 in just about every area, or even outperforms it. As we've said, it's a far smaller console than its predecessor too, with the overall volume down almost a third, the weight down 16%, and noise output and power draw both reduced as well. It's also worth factoring in the very strong games line-up the PS4 enjoys right now, with top-notch titles such as God of War and Spider-Man currently making PC and Xbox One owners green with jealousy. All current PS4 games work on the PS4 Slim, and so will every PS4 game released in the future too – Sony has made it explicitly clear that there won't be any PS4 Pro exclusives (just differences in frame rates). Then there's the PS Plus network, now offering as good a deal as ever – competitive or cooperative online multiplayer play for those who want it, and a selection of three free games every month as well. Back to the competition, and the PS4 Slim really has two main rivals: namely the Nintendo Switch and the Xbox One S. Sure, Nintendo has created something profoundly unique with the Nintendo Switch, but it's against the Xbox One S where the PlayStation4 has its toughest fight. Only a fraction more expensive, the Xbox One S offers fine looks, a decent games selection of its own... and a killer 4K Blu-ray player built in, which means it's a more rounded media player than the PS4 Slim, despite those millions of PS4 sales. Still not convinced whether the PlayStation 4 Slim is the console for you? Read on for more detailed thoughts. If you want to dig deeper into the differences between the two PS4 consoles, then check out our head-to-head guide: PS4 Pro vs PS4: what's the difference? Is the PS4 Slim better than the PS4 Pro? When it comes to specs, no. It's the PS4 Pro that's the superior console. It offers you 'true' 4K gaming, which is difficult to get on other devices without compromising. It's also bulkier on the outside and on the inside the GPU is a great deal faster, and although the CPU is architecturally similar it's been clocked at a faster speed. But that doesn't necessarily mean you should buy one. The PS4 Pro is better for those who want a premium gaming experience and have a 4K TV. If you don't have a 4K TV or money to spare, the PS4 Slim might be better for you. Can you play Fortnite on the PS4 Slim? Yes you can. Fortnite is free and available for most major consoles and mobile devices. Is the PS4 Slim 4K? No it's not. You won't get 4K with the PS4 Slim, if you're interested in 4K gaming and a 4K Blu-ray player you'll need to set your sights on the PS4 Pro instead. Cast your mind back to when the original PlayStation 4 hit the scene, and you may remember that its unconventional shape drew quite a bit of attention when it was first revealed. The slimmed down PS4 that debuted in 2016 more-or-less retained the core visual identity of the first PlayStation 4, but made the parallelogram package even more compact, smoothing off some of the edges. The first PlayStation 4 measured 27.5 x 30 x 5.3 cm, whereas the latest PS4 Slim cuts that down to 26.5 x 26.5 x 3.8 cm, roughly a third smaller. The overall weight is comparably lighter too. The first PS4 mixed shiny and matte plastics, but the PS4 Slim extends the matte black finish all over the console. The top-mounted colored light bar indicator – showing sleep, wake and off statuses – gets dropped in favor of small illuminated dots over the power button (which are actually harder to see, so take care before unplugging the unit). As before, the disk drive slot is a front-facing affair, above small power and eject buttons. More recent revisions of the PS4 also featured physical buttons on the console, but the launch edition PS4 favored touch-sensitive controls instead. Two USB ports sit on the front of the PlayStation 4 Slim, as was the case on earlier PS4 models, but they're now much further apart and slightly easier to plug into. Both 500GB and 1TB versions of the PS4 Slim are available, though the former is much rarer. If you opt for the smaller of the two you might find your hard drive fills up surprisingly quickly with the console's reliance on mandatory game installs, but thankfully it's fairly easy to upgrade the internal hard drive or install games to an external hard drive. Around the back is the power plug socket (no need for an external power brick), a HDMI port, the PlayStation Camera's expansion port (essential for the PlayStation VR) and an Ethernet network jack socket. The only major casualty of the slimmed-down design is the Optical Out port on the rear: HDMI will suit the needs of many gamers for carrying audio signals, but the Optical Out port will be missed by those hooking up older home cinema receivers, or souped-up gaming headsets. The PS4 Slim has plenty of nice design touches dotted around its chassis though. The iconic Square, Triangle, Circle and Cross symbols of the PlayStation brand are stamped into the side of the console (with the Circle acting as a fixture for those wishing to stand the console upright with a base accessory). The same symbols are found stuck to the bottom too, acting as feet to raise the machine off a surface for improved airflow. All in, it's a well-considered design, markedly justifying its "Slim" street name. Setting up the slim PlayStation 4 is very easy – especially if you're upgrading from the original PS4 (or even a PS3), because you can use all the same cables, so no need to stretch behind your TV. Simply plug in the included HDMI and power cables and connect to the internet to download the console's various patches and updates. Alternatively, you're able to skip Wi-Fi or Ethernet altogether and just pop in a game. Unlike the Xbox One, you can get to the homescreen without initially connecting to the web and patching first. Since the very first PlayStation, Sony's home consoles have led the charge when it comes to media playback support. The PS One made for a great CD player, the PS2 was many gamers' first DVD player, and the PS3 introduced a Blu-ray deck and USB playback. The PS4, while not introducing a new format of its own, picked up the baton passed by the PS3, offering wide-ranging streaming service support, Blu-ray and DVD playback, USB media functionality and even banging out the tunes with its own Spotify player. That's been carried over to the PS4 Slim. What the PS4 Slim doesn't do, however, is offer an answer to the Xbox One S's 4K Blu-ray player, instead sticking with the original PS4's standard full HD Blu-ray player. It's still a strong deck, but anyone looking to show off their 4K TVs with the new PS4 will be disappointed (and it's notably absent from the PS4 Pro too). Need a player for your physical media? Check out our guide to the best 4K Blu-ray players. You could argue that with streaming increasingly used to watch media content, it's not a desperately needed feature, especially if it keeps the overall cost down. But it will age the PS4 Slim console, preventing it from being fully future-proofed. What's perhaps more annoying is the complete removal of the optical out audio socket, which could cause headaches for those with older AV equipment. However, one upgrade that applies to the entire range of PS4s, the PS4 Slim included, is HDR support. This adds greater detail to light sources in an image, and is pretty much a staple in TV tech these days. 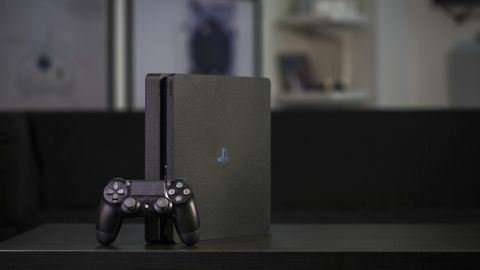 All the other streaming services and apps featured on the PS4 return for the PS4 Slim, including (but not limited to) Netflix and Amazon Prime Video, as well as BBC iPlayer and TV from Sky in the UK, and HBO Go and Hulu in the US. Sony's own movie rental platform is available too if you're looking for the latest Hollywood releases. YouTube is here, as is Twitch game streaming, and a Spotify Connect-enabled version of the popular music streaming service, letting you control tunes on your telly from the comfort of your phone. Looking out for great savings on the PS4 Slim in Australia? Check out our sister site Getprice to compare prices!